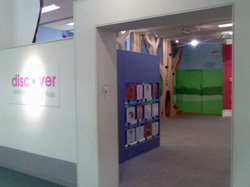 Children aged between 2-8 years can make active links between people, other cultures, the natural world and art in Discover, a gallery of play, learning and finding out. Activities will encourage children and families to interact with the objects and each other, try on new roles and use 'hands-on' exhibits. Paintings, puppets, photos, masks, birds, animals and fossils break down the mystique of 'museum objects', and show that you do not need a degree in art to 'understand' a painting or be an expert scientist to study nature.